What is the Place of 3D Pencil Drawings in the World of Art (and Entertainment) ? Nowadays, it seems as though the 3D pencil drawings are everywhere, from blog posts flooding Facebook, to Instagram pages that are dedicated solely to this type of drawing, all the way to the tattoos inspired by them. The draftsmen seem to be turning to 3D instead of sticking to the good old 2D pencil drawings, depicting everything from vodka bottles to the frighteningly realistic tarantulas, scaring the boys and girls on the World Wide Web. 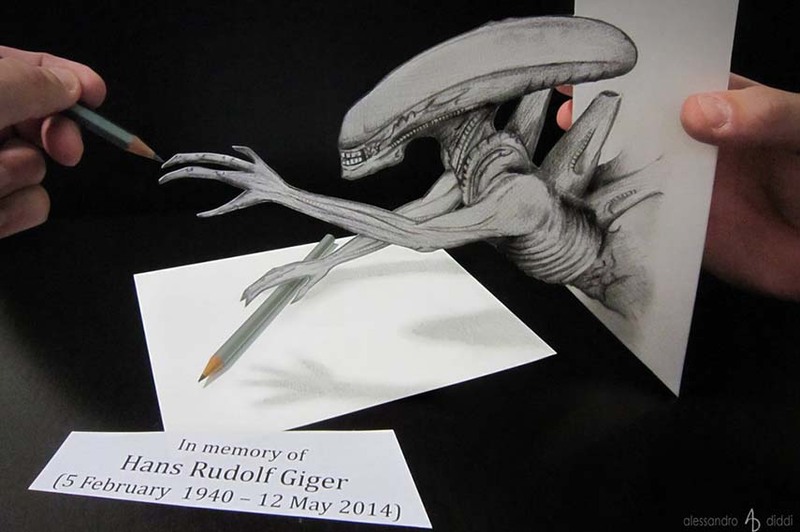 These drawings are the craze of the now, and it is impossible not to notice them. Whether it is the raw talent or years of practice that make these 3D pencil drawings pop out of the paper as they do, they are nothing short of amazing and represent the true hyper-realism. The artists who produce such pieces are many and growing in number each day, so now would be the perfect time to address this latest trend and its place in the world of art and entertainment. 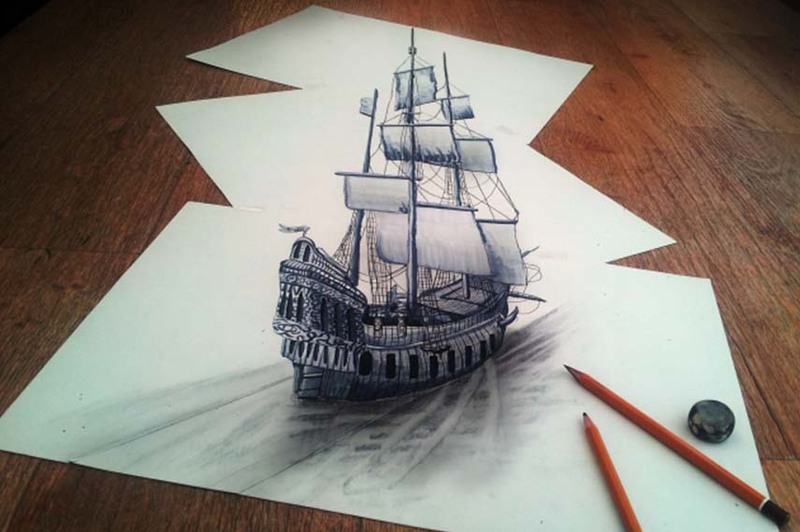 3D Pencil Drawings – An Optical Illusion? 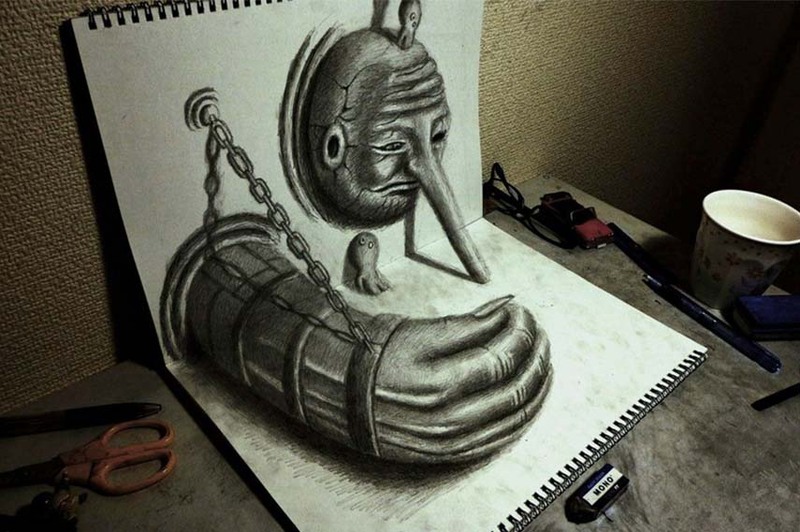 The appeal of 3D pencil drawings lies in the fact that people love to have their eyes tricked. In this type of drawing angle is everything! A stunning image can be seen as a blur of lines and shadows when observed from a different perspective, making our minds work overtime to figure out how did the artist really manage to master the skill of angling and perspective in order to create the drawing. The “Ahhh, so it’s an optical illusion” is probably the most pronounced sentence after the big revelation, which brings us to the origins of 3D drawings – Op Art. Op Art, or optical art, is, as the pretty self-explanatory name says, abstraction based on optical illusions. These types of artworks are usually done in black and white and make the viewer think that there is some type of movement, hidden image, or warping going on. Some say that the origins of Op Art can be traced back to Cubism, Constructivism, Dada, Neo-Impressionism, and Futurism in terms of color and graphic effects while others credit the German school Bauhaus as the ancestor of optical art. It is also considered that Op Art originates from Anamorphosis, a contorted projection that requires the use of special devices in order to see the image, and Trompe l’oeil, a technique that employs realistic imagery to create the impression of a 3D object on a flat surface. As we have previously mentioned, a large portion of successful 3D pencil drawings lies in the clever utilization of perspective, and the deep understanding of it. These artists do not rely on their mere talent, they also study hard, do a lot of research, and practice diligently in order to produce a successful and life-like drawing. They use multiple sheets of paper often cut so it would appear as the edge of the depicted object, clever shading, and, the star of the day, angle to give the drawing life of its own and make us scratch our heads and start wondering about what is real and what isn’t. So where do these 3D pencil drawings belong in the ever-growing world of art? Well, they are everywhere! 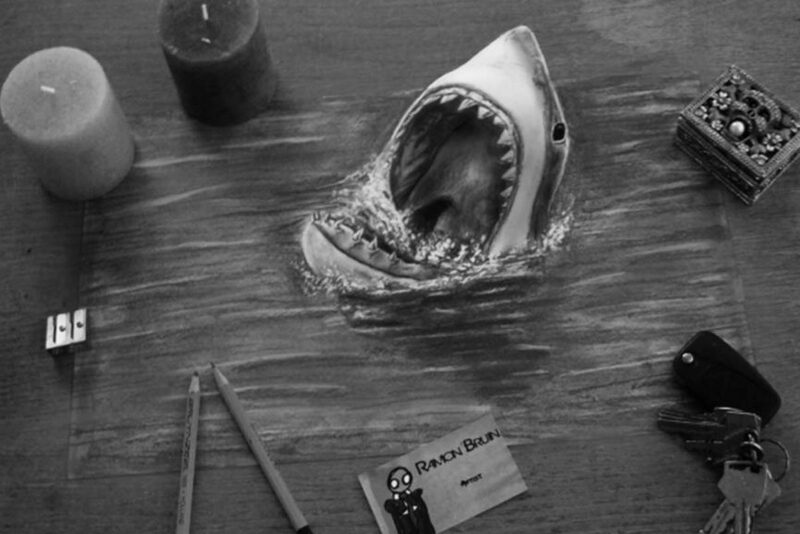 Nowadays, more and more artists are emerging with their hyper-realistic 3D pencil drawings. Although it may not be as big as some other movements yet, 3D art is becoming more and more present, and drawing more and more attention each day. These works have jumped out (pun intended) from DeviantArt, Facebook, and Instagram to the homes of celebrities, sportsmen, politicians, and to the offices of various companies. 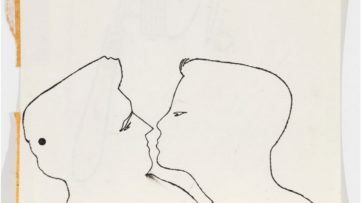 Furthermore, the popularity of these drawings grows even stronger as more artists opt for depicting the famous singers, actors, and models that seem to jump out of the paper. So, for us, this means that you can probably own a life-like Elton John or David Beckham smiling to you in the comfort of your home. 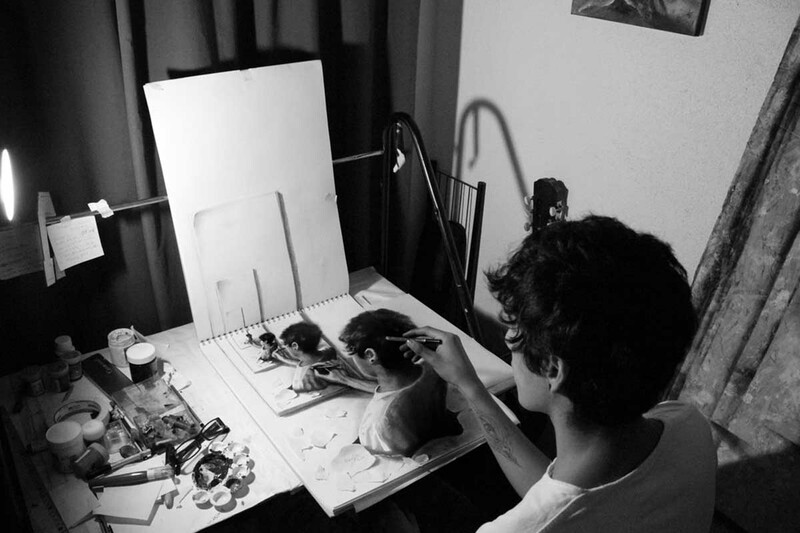 Who are the Artists that Make 3D Pencil Drawings? We know that we cannot possibly cover all the draftsmen and women who show their skill in the 3D drawing world, but some of the most prominent names of this, relatively new, trend are solidifying their statuses as the leaders of the movement each day. Ramon Bruin is a Dutch artist whose invented style ‘Optical Illusionism’ is a blend of drawing and photography, as his works can be best seen when photographed from a particular angle. He uses graphite pencil most times, but in some works, he incorporates the color pencil, acrylic, or ink. 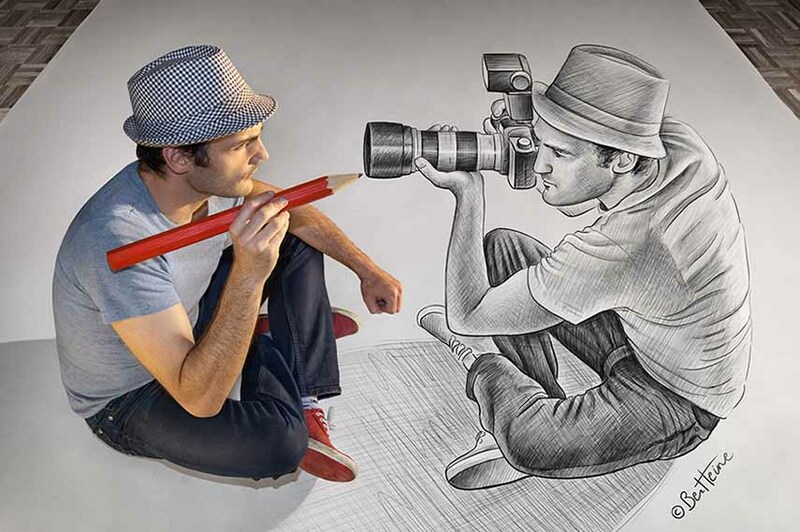 Ben Heine is a Belgian artist who creates large-scale 3D drawings. He is famous for stepping into his own art upon completion and takes a series of photographs with him as part of the artwork. 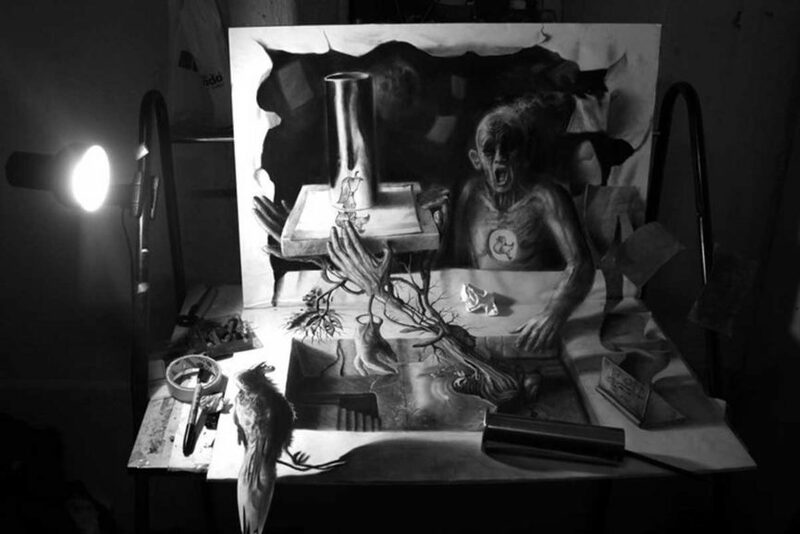 Some of his pieces are larger than 13 by 10 feet, and he uses as many as 15 pencils and three charcoal sticks for large dark areas of his compositions. He has exhibited his works around the world, in Belgium, South Korea, Russia, Hong Kong, the UK, Spain, Germany, The Netherlands, France and Italy, among other places. Alessandro Diddi is an Italian draftsman whose works convey the message as old as times: that our eyes can, and will, play tricks on our minds. Sometimes, the eye can make us think that dimensions exist when they are not there and make us perceive his art as tangible. He often cuts the paper to give the impression of edges of his subjects and on multiple occasions uses more than one sheet of paper to create his drawings. Nagai Hideyuki is a Japanese artist who primarily creates sketchbook drawings. Nagai’s dream was to become a cartoonist, but upon seeing Julian Beever’s amazing 3D street art, decided to pursue the multi-dimensional art. 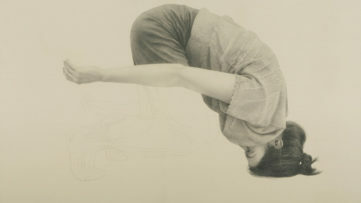 However, since drawing on the streets was illegal in his home of Japan, he transferred his talent and ideas into his sketchbooks, for which he only needed a pencil, some paper, and lots and lots of practice, without breaking the law once. Fredo is a Chilean artist who was inspired by the works of great masters such as M.C. Escher, Rembrandt, Beksinski, and Arcimboldo. Fredo’s art was submitted to DeviantArt back when he was only 17 years old, and since then, his popularity among the 3D drawing world has continued to grow. 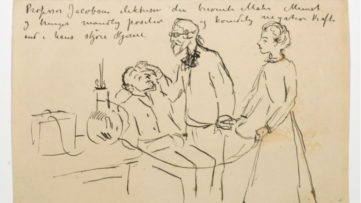 Some of his drawings take from 30 minutes to complete, and some require over a month of work for the final product to be executed. What is next for 3D Pencil Drawings? Since these drawings are still not as recognized as the traditional illustration, and since some consider that they are not really art at all, it will be interesting to see how will these 3D pencil drawings find their moment under the spotlight in the frame of traditional world of art. What is certain is that these works require an immense amount of hard work and practice, and the artists who choose to express their creativity through them will surely continue to fight for their spot in the contemporary art market. With the growing popularity of digital art, it seems that the audiences are turning back to the more traditional techniques as they feel that the computer can never replace the human touch when it comes to art, which is definitely good news for 3D draftsmen and women. We will not get into the personal preferences of the art collectors in terms of what they consider artistically valuable, as there is an old Latin proverb “Suum cuique” or “to each his own”, which fits perfectly with the ongoing debate of whether 3D pencil drawings are worthy to be put into the exhibition spaces of big galleries and sold at famous auction houses. The fact is, the world has gone crazy about these artworks, and we can definitely understand why. Featured image: Fredo – Fractal, ©2013-2016 byfredo via byfredo.deviantart.com. Images in slider: Fredo – Subjetivo, ©2014-2016 byfredo via byfredo.deviantart.com; Ramon Bruin – Shark Infested Furniture via ramon-bruin.com. All images are for illustrative purposes only.